Motor vehicle accidents are the most common cause of personal injury claims throughout the United States. According to some sources, South Florida drivers are among the worst in country when it comes to the rate in which they are involved in car or other motor vehicle accidents. Car, Truck and Motorcycle Accidents are also the leading cause of death for all ages between 3 through 34, according to a 2006 analysis. Have you or a loved one been injured in a car accident in Boca Raton, West Palm Beach, Delray Beach, Jupiter, or, perhaps, in the surrounding areas of South Florida? If so, it is important to consider involving an attorney as soon as possible. An attorney's early involvement in your case can help ensure that you reach a positive outcome in your case and ensures that you have the opportunity to recover the highest amount of financial compensation possible for your injuries, damage to your vehicle, and more. Filing an insurance claim or a lawsuit after a car accident does not have to be a painful process. In fact, with an experienced Palm Beach County Car Accident Attorney from Whittel & Melton at your side, you can focus on recovering and spending time with loved ones while your case is in the hands of professionals. Our lawyers will handle virtually every aspect of your case, including any and all communication and negotiations with the other party's insurance company, with the other driver, and with law enforcement. Many times, we are able to coordinate with doctors and other medical providers to provide health care while your case is pending, even if you don't have health insurance. The best way to learn whether you have a case is to contact one of our attorneys directly. No matter who was at fault or the particular circumstances of the accident, involving a lawyer is the best way to get a thorough understanding of your rights and options after any motor vehicle accident, minor or catastrophic. 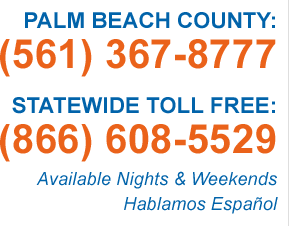 Local (561) 367-8777 or statewide, toll-free: (866) 608-5529 for a free consultation with one of our attorneys.